It seems most fitting that the Crawford Fund has launched its 2019 Food Security Journalism Award at a National Rural Press Club event at the National Press Club, co-hosted by the Fund, Australian Centre for International Research (ACIAR) and the Department of Foreign Affairs and Trade (DFAT), featuring a preeminent thinker on food and nutrition security. 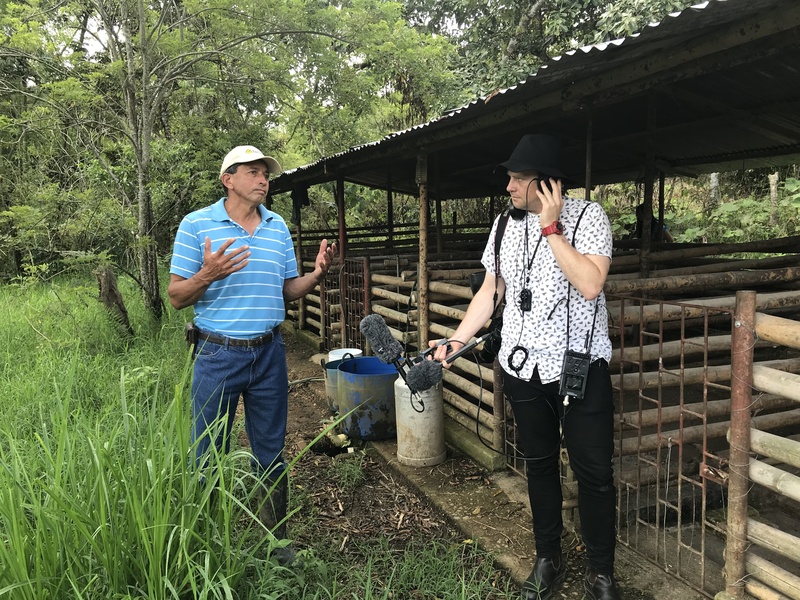 Brett Worthington, 2016 Journalism Award winner on his visit to Colombia. Our 2018 winner, Clarissa Collis, will be visiting ICARDA in Morocco in April this year. “Today we are here at the National Press Club, co-hosting this sold out event with the National Rural Press Club, ACIAR and DFAT, to hear from an eminent international speaker, Dr Shenggen Fan, Director General of the International Food Policy Research Institute (IFPRI) who asked the probing question, ‘Is the world food system broken?’ and reporting on the major trends and challenges the global food system faces,” said Dr Colin Chartres, Chief Executive of the Crawford Fund. “Challenges related to rapid urbanisation, changing diets, climate change, political uncertainties and anti-globalisation sentiments as outlined by Dr Fan have significant implications at national and regional levels and all impact the important work of the Crawford Fund and its partners,” said Dr Chartres. “The Crawford Fund’s work in both promoting the importance of Australia’s support for international agricultural R&D and in training existing and emerging scientists and managers to develop solutions and policies to overcome these critical challenges provides real-world examples of the differences that are being made. “It is fitting that today, after hearing Dr Fan’s view on the challenges we face, that we proudly launch our 2019 Food Security Journalism Award, as part of our efforts to draw attention to the significant role Australians play in the international agricultural research and development arena, and the work that remains to be done. “This annual award sees a journalist undertake a ‘seeing is believing’ visit to agriculture for development projects in the field, and interact with passionate students, researchers, and local farmers, and to share their stories with the Australian public. “Much of the vital food and nutrition security and agricultural development work that Australia supports occurs overseas, beyond the day-to-day focus of the media spotlight. This award provides an opportunity to highlight the difference our agricultural development programs are making in changing the lives and livelihoods of those who need it in our region, and the benefits that flow back to Australia. “I have no doubt that the journalist who wins this award will benefit immensely from being on the ground and seeing agricultural development and research first-hand and meeting the extremely passionate people dedicated to improving food security,” said Dr Chartres. The winning journalist will be provided with a Crawford Fund ‘seeing is believing’ visit to a developing country to view and report on current Australian and international research and training that has a focus on food security. Entries are now open for print, broadcast and internet-based reports, by working Australian journalists, around food security. All entries need to have been published in the 12 months leading up to the closing date of COB Monday, 3 June 2019, and should be submitted to the Fund’s Director of Outreach, Ms Cathy Reade by COB Friday, 14 June 2019, to be considered by a reviewing/judging panel. Cathy is also happy to take inquiries. The winner will be announced at the Fund’s Annual Conference to be held in Canberra in August. Further details, including the application and judging processes, are available here.